Private Hartley Smithson 491418 of the Labour Corps, died in hospital in Ripon, Yorkshire, of pneumonia on 12 January 1918. He was thirty three and a single man. Before he enlisted in June 1917 Pte Smithson was a loom overlooker at L Whittaker and Sons Ltd, Grane Road Mill. He was the third son of Christopher and Ann Smithson of 177 Grane Road. He was a regular attender at St Stephens Church. Whilst Pte. Smithson was in training at a military camp near Ripon he became ill, presumably as a result of the arduous training in the wintry conditions at that time. After several days in hospital, his condition deteriorated and he died of pneumonia. His parents requested that his body be brought home. Pte Smithson was buried in Holden Hall Cemetery on 18 January. He lies in Grave C1101. Holden Hall Cemetery is owned by Rossendale Borough Council. It opened in 1903 and covers over eleven acres. There is a total of thirty two soldier’s graves from the 1914-1918 war and four from the 1939-1945 war. 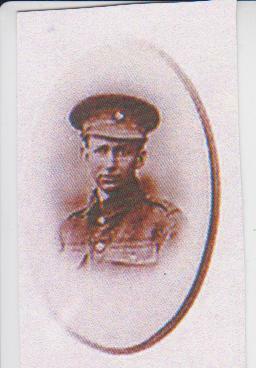 In loving memory of Private Hartley Smithson, Labour Reserve, who died in Hospital at Ripon on January 12th 1918. But God did see Eternal life was best for thee." From Father, Mother, Sisters and Brothers. 177 Grane Road, Haslingden. Will always be the same." "We shall never forget you, we loved you too dearly. Our thoughts often dwell where they seldom are seen." From his loving Sisters, Brothers, Sisters in law and Brothers in Law. We'll meet them in the "many mansions,"
All gathered home at last." From Uncle and Aunt and Cousins, Waterside. Recall sweet memories of happy days".